Having failed to show the courts any legal justification for arresting the IPOB leader, President Buhari’s secrete police disregarded the court rulings, and further arbitrarily charged Kanu with “Treasonable felony.” In a conversation with the Nigerian press, President Buhari asserted that “Kanu committed heinous atrocities against this country” in a meddlesome attempt to coerce the judiciary to persecute Mr. kanu. He has vowed not to release Kanu claiming that he would “jump bail.” He has found Kanu guilty until proven guilty. Mr. Kanu’s precipitous rise to prominence, and subsequent ongoing persecution, results from his knack for truth telling, and vociferous exposure of the inhumanity and wickedness of British-Nigeria via radio Biafra educational programs. Background At first, Kanu was kidnapped from his hotel room (by enforced disappearance) until Radio Biafra blew the whistle as soon as the plot to kill Mr. Kanu was leaked; by then he had disappeared for four days without any word from the Department of State Services (DSS, Buhari’s alter ego and tool for tyranny). 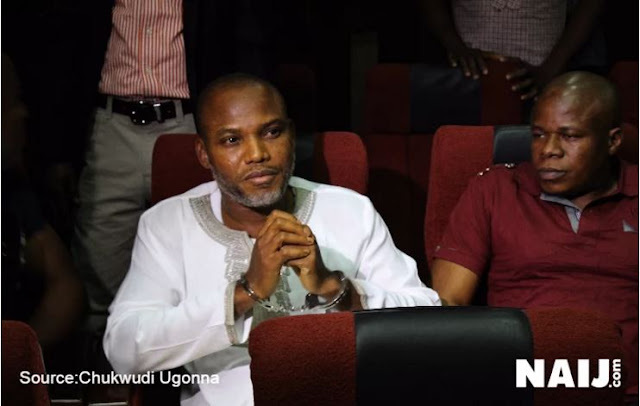 Now confused because the genie was out of the bottle, DSS quickly arraigned and charged Kanu on October 19, 2015 with criminal conspiracy (for vociferously seeking to be free from marginalization, extermination and Islamization), intimidation (for exposing evil doers), and belonging to unlawful association (for teaching and organizing his people to overcome the evil that British-Nigeria portends for them)—these charges are “heinous crimes” according to President Buhari. By his own logic, Buhari ought long ago to have been done away with because he not only made threats, and incited riots; but have on many occasions, actually executed these threats. He treasonably toppled a democratically elected government in 1983. 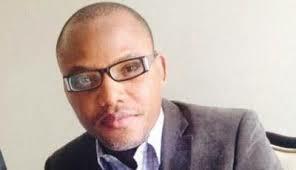 He incited the 2011 elections riots that killed more than 900 people, many of whom were Biafrans. Buhari declared total commitment to the full implementation of Sharia in British-Nigeria. He said that attacking Boko Haram terrorists was tantamount to attacking Muslim North, and many such outbursts. Buhari is an actual Biafra war criminal and a genocidist. Kanu’s counsel filed another motion seeking to enforce previous court orders. Realizing that the court’s hands may be tied by rule of law, Buhari’s alter ego DSS quickly brought a counter motion asking the trial magistrate to recuse himself on the ground that he lacked jurisdiction on charges of terrorism; and simultaneously superimposed the underhanded “ex-parte order” to detain Kanu for additional 90 days, thus flouting the existing Magistrate Court orders. The next hearing was then set by the Abuja High Court for Thursday, December 17, 2015 whereat the Court found that the continued detention of Mr. Kanu was illegal, and that the charges brought against him had no merit, and accordingly, acquitted Kanu of all charges. Prior to the acquittal, DSS had attempted, on October 23, and November 18 consecutively, to truncate the due process with their usual impunity by going to court without the defendant. Mr. Obeta, Kanu’s former counsel objected and the judge affirmed that the defendant must be present before further hearing. Questions about Kanu’s whereabouts raised suspicion that they had murdered him. It is widely understood that British-Nigerian typically murder high profile prisoners in their custody with impunity. The first judge to entertain the “treasonable felony” charges was too embarrassed by the apparent witch hunting and quickly recused himself as soon as the defendant objected citing lack of confidence because subsisting court rulings were not obeyed. For about three weeks, there was no judge to take the case because the government, it appeared, was shopping for a pliable judge. By January 3, a new judge, Tsoha presided, and immediately denies Kanu bail. The new judge has echoed the president’s prejudice that Mr. Kanu will “jump bail” if the rule of law were followed. Note that every new date presupposes an ‘adjournment’ from the previous court date. 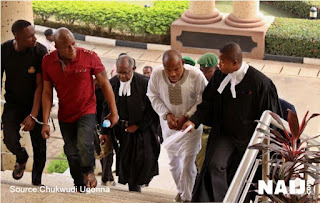 On February 9th, court resumed, only this time with the government prosecutors requesting that government witnesses against Mr. Kanu be allowed to wear masks in court or testify in secret. This ought not to surprise you because many innocent Biafrans, as well as northerners who narrowly escaped massacre of more than 1000 Shiite Muslims by Nigerian Army are languishing in jail without charges or due process. Kanu’s counsel argued that government prosecutors wishes to use materials from the dismissed terrorism charges to seek considerations for “treasonable felony”—a totally different ball game; and that “Prosecution cannot accuse his clients in public and seek to try them in secret.” As usual, court was yet again adjourned until the 8th day of March with Kanu still incarcerated through it all. Justice Tsoha however sided with the defendants and denied motion to mask witnesses. Whether the judge will show fidelity to the law is yet to be seen, because denying Kanu bail and citing Buhari’s public sentiments is suspect. Mr. Kanu will likely never get a fair trial under this judge or any other as long as Buhari is president. It is clear that a travesty has been wheeled into motion. Again, Kanu is guilty until proven guilty. Kanu and his legal team must not consent to this charade. He is better of boycotting the court because there is no chance that he will get a fair trial in a Nigerian Court. Moreover, by her international treaties, Nigeria has no power to try Nnamdi Kanu for exercising rights that are ratified under the United Nations Human Rights Commission, and UN Charter on the Rights of Indigenous Peoples which Nigeria is cosignatory. It is worrisome for UN, and relevant world bodies to remain silent as Nigeria brazenly flaunts international law, treaties, and human rights. obliterate every infrastructure in Biafraland, and marginalize Biafrans. Biafrans have endured genocide of 3.5 million for the sake of crude oil, greed, jealousy, and are still daily being killed by Nigerian forces, and hitherto facing existential threats posed by Islamic terror expansionism. Nnamdi Kanu therefore is absolutely within his human rights, national rights, and international conventions on human rights to establish Radio Biafra, and speak out in defense of his people—who are clearly marked for annihilation. While Mr. Kanu was being arraigned in Court on February 9, a group of Biafrans, who deliberately steered away from the motor roads to avoid trouble gathered at a school, praying and singing praises to God for Kanu’s victory. As they sang, a squad of Nigerian Army and Police arrived and began surrounding the crowd the same way members of Shiite movement were surrounded in Zaria before the massacre. Then, without provocation, the army open fire killing 22 Biafrans; wounding more than 30 others, and abducting more than 100. Thirteen of the abducted or wounded Biafrans were later found dead, doused with a certain chemical which disfigures and shrinks their bodies, and then dumped in a shallow grave at Aba Borrow Pit. Prior to Mr. Kanu’s abduction, British-Nigeria government massacred 100’s of Biafrans who were peaceably evangelizing for the independence at Port-Harcourt, Aba, Onitsha, and Enugu. But make no mistake, immediately Buhari returned to power, the brazen and wanton killing, massacre, enforced disappearance, mass abduction, and incarceration of Biafran protesters irrefutably intensified. Curiously however, high profile Boko Haram suspects, and military officials who were either once in custody or dismissed on suspicion of allegiance to Boko Haram under the previous president have mostly been either released or reinstated by Buhari. But Mr. Kanu who has never taken a life or plotted a coup has been in custody without trial for 132 days as at Feb 23, 2016 and counting. War will breakout if Nigerian forces continue massacring unarmed protesters. The trial of Mr. Kanu is the height of illegality and impunity. Nigerian Army and Police have killed more than 200 defenseless Biafrans for seeking freedom. By the 1969 genocide, her forcible occupation, ongoing massacres, and marginalization, Nigeria proves beyond reasonable doubt that the people of Biafra do not belong in Nigeria. It is abundantly clear that Nigeria has no moral justification or legitimacy to remain as a state or forcibly occupy Biafra. Only an independent state of Biafra will safeguard the life of Biafrans and end the endless spate of violence and progressive genocide against Biafrans.